A white Freshwater pearl bracelet is a very distinguished piece of jewellery for any woman to have in their jewellery collection. Some can look a little fun and flirty, whereas others have a more elegant and sophisticated look to them. As these look great when worn with other accessories especially other pieces of pearl jewellery they an indispensable piece of jewellery for any woman to now own. Although they look very delicate a good quality White Freshwater pearl bracelet will last for many years to come, as well as help to subtly enhance a woman’s natural beauty. Whether a woman chooses to wear such jewellery on its own, or with other pieces of jewellery they exude an understated beauty that suits women of all ages. So please let us help you to decide what bracelet it is you would like to choose from our collection. 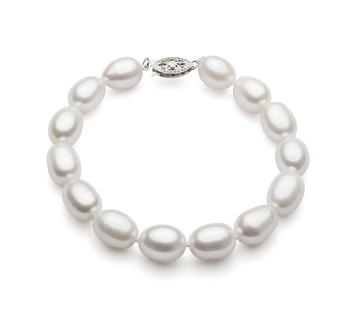 Anyone of our white Freshwater pearl bracelets is going to add a touch of sophistication to any outfit you would like to wear it with. This short guide will help you to better understand just what style of bracelet will suit you the best. Although a very minimalistic piece of jewellery, a single strand white Freshwater pearl bracelet provides you with a very easy way of including pearls into your wardrobe. A bracelet that contains pearls measuring 6-7mm in diameter is perfect for wearing with casual relaxed attire, whilst a bracelet with larger size pearls looks good if you pair it with semi-formal or business attire. A double strand bracelet made up of white Freshwater pearls is very elegant and distinguished looking. 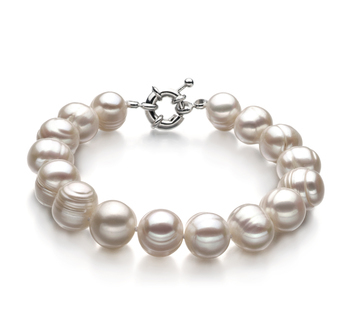 This is the perfect piece of white Freshwater pearl jewellery to wear on special occasions. 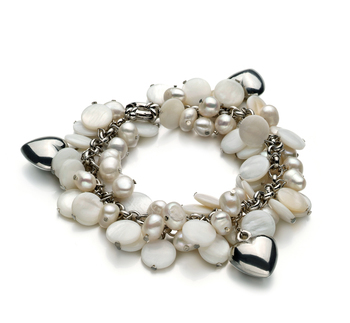 This is the type of bracelet that can easily be worn together with other pieces of matching Freshwater pearl jewellery. This is the kind of bracelet that women like to wear who love to be able to keep up with the latest trends and fashions. 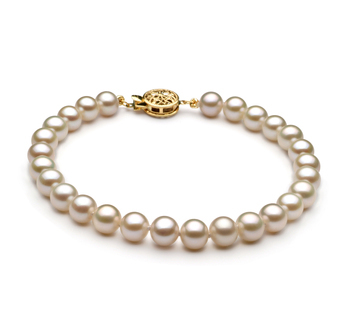 A white Freshwater pearl bracelet with charms is perfect for young women or girls to wear as it helps to accentuate their more playful style. 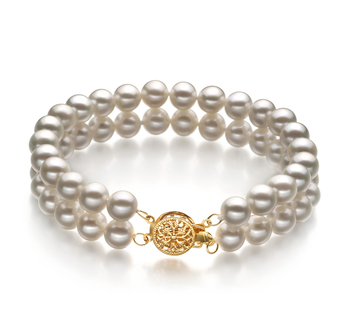 This is a bracelet that is made up of very delicate pearls that will complement all types of skin tones. A triple strand White Freshwater pearl bracelet tends to be favored by more mature women who regularly have to attend office meetings or formal events. With their distinct clasps, this type of pearl jewellery will help to make a conservative outfit look more glamorous and help to add a touch more polish to that simple little black dress. 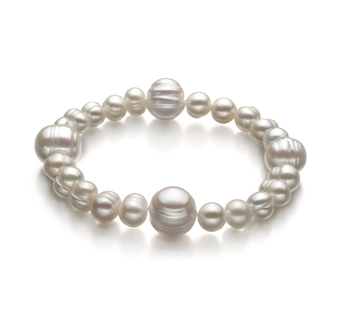 A White Freshwater pearl bracelet that doesn’t have a clasp isn’t just convenient to use but also can prove to be a lot more comfortable to wear. Such bracelets are easy to slip on and off the wearer’s wrist, so making them ideal for any woman or girl who is always rushing around but still needs to maintain a polished look to their outfit. 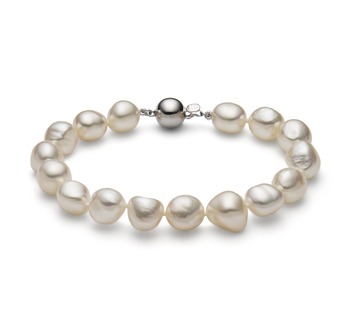 However, the addition of silver, yellow or white gold clasp helps to add more value to a white Freshwater pearl bracelet. The inclusion of such a decorative piece also helps to make this type of bracelet look more sophisticated. 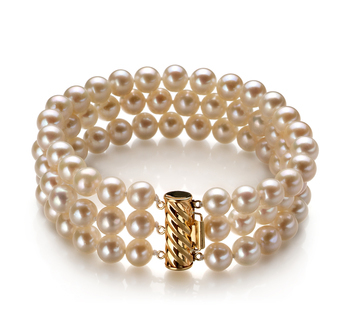 You should think about getting a bracelet with a clasp if the piece is likely to be worn to work or to a party. If this is going to be the first piece of pearl jewellery you have ever purchased then it makes the ideal choice. A white Freshwater pearl bracelet is a very versatile jewellery item that you will be able to pair with a variety of different outfits in your wardrobe. One occasion when the presenting of such a bracelet would be much appreciated would be on someone’s birthday. This would make an amazing to give to your mother, your sister, your daughter or your granddaughter, as we have various different styles in our collection that will suit each one of them. For young girls, a single strand white Freshwater pearl bracelet is the perfect gift, but for teenagers, they will love it when you give them our beautiful white Freshwater pearl charm bracelet. For your mother or your sister, they will love it when you present them with a bracelet that is made up of larger size pearls, as this will add a touch of sophistication to their outfit when worn. 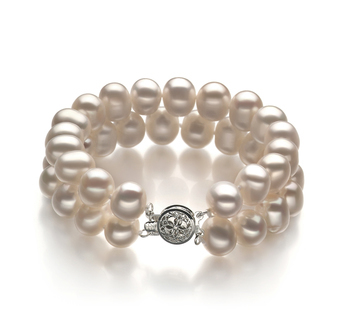 Especially think about presenting someone you know with a white Freshwater pearl bracelet if they are going to be 30. 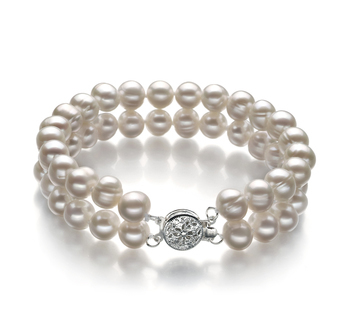 Pearls are closely associated with the number 30 and will really help the person to whom they were presented to how very special this date in their life is. So we hope that with the information we’ve provided above you will find the whole process of choosing a suitable white Freshwater pearl bracelet a lot easier.